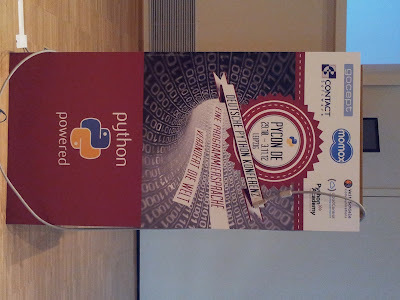 I just came back from PyCon DE 2012 in Leipzig. I went their not knowing what to expect and came back a real fan. Not that I am really doing that much with Python, but the community feeling at the conference beat all my previous experiences. Python is sometimes called a glue language, it seems to be also true for the attendants. Of course they all have an interest in the language as a tool, but they come from all areas of IT and bring their own experience to share. Between physicists from the CERN, web developers and tool developers there was something new for everybody. Especially noteworthy where the Lightning Talks that happened at the end of every conference day. Not only entertaining but also very informative. The speakers used their 5 minutes mostly to present some tool or idea to the audience and ask for help or git pull requests. That is certainly a strong sign of a vibrant community. The 2013 PyCon DE will be in Cologne and the 2014 in Berlin. Even if you don't dream in Python, the conference is worth to attend to meet like minded fellows and get input for new ideas.